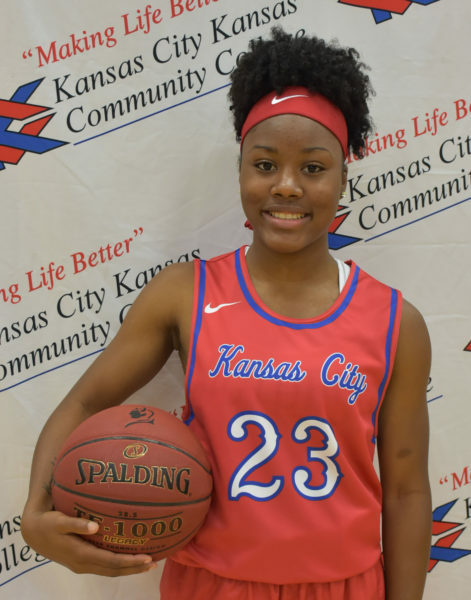 KCKCC women alone in first after 65-54 revenge win at Labette – Welcome to Wyandotte Daily! Kansas City Kansas Community College’s Lady Blue Devils stand alone atop the Jayhawk Conference. Avenging their only conference loss, the No. 7 ranked Blue Devils (22-3) posted a workmanlike 65-54 win over No. 16 Labette (17-9) at Parsons Saturday while No. 10 Highland was thrashing No. 4 Johnson County 92-70 in Highland. The win was KCKCC’s 11th in the last 12 games. When the smoke cleared, KCKCC stood atop the standings at 4-1 followed by Highland (4-2), Johnson County (3-2) and Labette (3-2) heading into a monumental KCKCC-JCCC collision Monday at 5:30 p.m. in Overland Park. Originally scheduled for Wednesday, the game had to be moved back by icy roads. JCCC is 23-2 overall; Highland 20-3. Still smarting from a 74-67 loss to Labette in their home conference opener, the Blue Devils grabbed command early and never let go Saturday. Jumping out to an 8-2 lead, KCKCC led by as many as 16 points on the way to a 35-26 halftime lead. The lead bulged to 18 points midway through the third quarter and the Cardinals never got closer than nine points in the final period. “Our defense was great today,” KCKCC coach Joe McKinstry said. And that’s probably an understatement. The Cardinals were limited to just one of 20 3-point attempt (5 percent) after draining seven in the first meeting. For the game, Labette was 18-of-64 from the field for a chilly 28.1 percent. Individually, the Blue Devils were led by freshman Lenaejha Evans and sophomores Lillie Moore, Kisi Young and Caitlyn Stewart. A 5-9 guard from Conway, South Carolina, Evans had her finest all-around performance. Sharing game scoring honors with 15 points, Evans also shared the lead in rebounds with eight and led in assists with four. Evans took just seven shots, missed only one and was 3-for-3 from 3-point. Moore, who was 6-of-10 from the field, also had 15 points, four rebounds, three assists, two blocks and no turnovers while Young had 10 points, eight rebounds and three assists on a night scoring and rebound leader Nija Collier was limited to five points and two rebounds. “Lenaejha Evans was fantastic and so was Lillie Moore,” McKinstry said. “And Caitlyn Stewart was very good handling the ball – just one turnover and she probably played 35 minutes.” Stewart had four points and one assist. While guilty of 21 turnovers and outrebounded 38-37, the Blue Devils had 13 assists on 22 field goals and made the most of only 48 attempts, converting 22 for 45.8 percent. “We need to do a better job of rebounding but overall, it was a great effort by our girls,” McKinstry said.